Carbide 6mm porcelain tile drill bit (straight shank) + 6mm pro masonry drill bit. This Armeg PTC drill bit has diamond-ground tip geometry that bites into tiles, eliminating wander & slip at the start of drilling. Armeg PTC tile drill bits need a constant flow of water at the tip through the entire drilling process. This is best achieved using an Armeg water feed kit (see related products below). Can achieve 15-25 holes in grade 5 porcelain, 50+ holes are possible in lesser grades of porcelain. 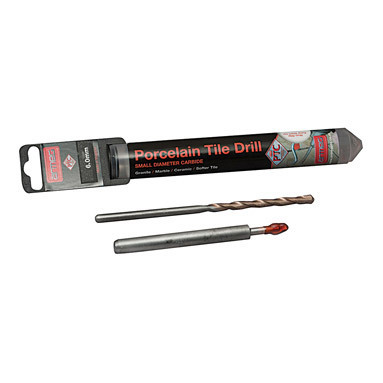 When it has been exhausted in porcelain it can still be used to drill softer tiles. Armeg PTC carbide drill bits can also be used in marble, granite, travertine, natural slate, quarry tiles, ceramic tiles, natural stone, limestone, rosemary roof tiles, etc. The drill bits should be used at the optimum speed range of between 700 and 900 rpm. Drilling outside this speed range will reduce the number of holes achievable. Sufficient pressure should be applied to keep the drill bit progressing through the tile (signified by tile dust being visible in the cooling water). Insufficient pressure will result in premature wearing of the carbide tip. Why are there two drill bits in my plastic tube? The drill bit with the red wax cover over the tip is the tile drill bit, the other is a professional quality masonry bit for producing the fixing hole behind the tile. Do NOT use the tile bit for drilling masonry!